I was working at a customers site where there were some infrequent issues with patching. While I was viewing all status message queries there was a frequent occurrence for status message ID 11756. This particular error points to a GPO Conflict. You can also use the report “Last Scan States By Collection” to validate my findings. The problem was occurring at an entire office location where all scans were failing. You can see below the majority of the failures are due to group policy conflict. My quick fix is to create a package with the bat file created from the lines of text. You see I delete the file, force gpupdate, software update scan and machine policy. 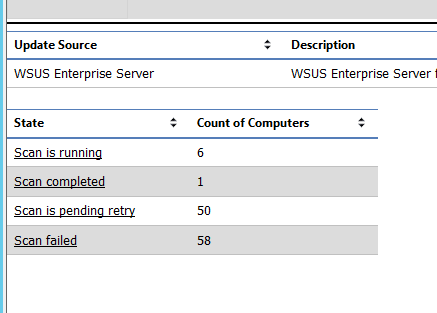 You can set up auto-remediation by creating a collection based on any system reporting status message 11756 within 24 hours and deploying the package to rebuild local policy. After this runs monitor your log files to verify the software update scan has ran successfully and also run the last software update scan report for additional validation.